It has been a long three months since you completed your first year of school. 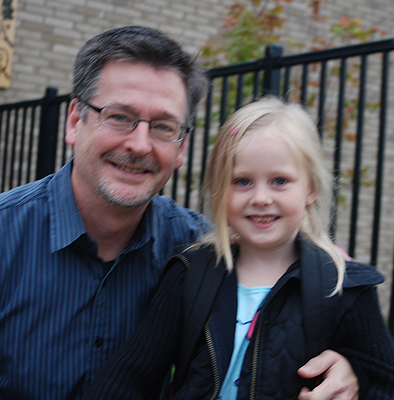 Your kindergarten year was an amazing learning process for both of us. The first few months were a tough adjustment. But after you transitioned to full day school , you went from shy girl to a top student in your class in just a few short weeks. You had a brief stint in summer school before it was time to toss aside the homework and experience one of the best parts of school life: summer break. Our first summer break was full of adventure and action, art and silliness. We became Tuesday afternoon regulars at The Rock for pizza, Shirley Temples, and tic-tac-toe. When we weren’t there we could be found at Blue C Sushi or Hale’s or “The Pirate Place” with our coloring books and crayons. McMenamins was your favorite stop before Aquasox baseball games. Most of our summer evenings were spent riding and making chalk art in the street. I would stand in the road looking for traffic while you and your brother zoomed by on bikes and scooters. Sometimes I would shuffle around slowly and try to catch you in a game you called “Zombie in the Road”. “Carlight Starbright!” became our warning call when cars approached. The pizza delivery vehicles were particularly speedy. You occasionally expressed your displeasure with them by yelling “Slow down!” as they sped by. Our gardening skills improved, as well. We grew corn, beans, peppers, onions, basil, cilantro, and sage. We may have as many zucchini and tomatoes this year as we did raspberries. You certainly pick the tomatoes the same as you do the raspberries: one for the bowl, one or two for you, and maybe that one in the bowl for you as well. After five minutes of picking you have an empty bowl and a full tummy. Our greatest adventure together this summer was our trip to Canada. It was my gift to you for your sixth birthday: a ride on the Victoria Clipper, a night at The Empress Hotel, and room service strawberry shortcake in bed while watching cartoons. We walked the Inner Harbour at night, watching the performers and sampling tasty food. You bought t-shirts and stuffed animals and squeezed them into your backpack that was already filled with t-shirts and stuffed animals. Your greatest discovery was that in Canada, Shirley Temples are made with orange juice instead of soda. At home now I have to ask you “Regular or Canadian” when I make one for you. During out brief time there you made friends on the boat, at the hotel pool, and in the grass in front of the Parliament Building. I will never forget watching you twirl in the bright sunshine, shouting “I love Canada!” I hope it is the first of many trips for you. The balance of your summer time has been filled with camping, visits with family, birthday parties, and sleepovers. You have plenty of stories to share with your new classmates. I think you did a marvelous job of enjoying your first summer break. Now the weather is turning colder and these early mornings are darker. The signs are there that it is time for school. You have met your teacher and she seems nice. The supplies are ready: backpacks and crayons, glue sticks and fruit snacks. All that is left now is to step into your classroom. But until then we have just a bit more time together. While I am writing this you are getting dressed and sleepily wandering about, looking for shoes. Your egg and bacon breakfast is on the kitchen counter. While you tuck in to that I will drag your sleeping brother out of his bed. He is likely asleep but there is always the possibility he is pretending to be comatose just to mess with me. A couple of jabs in his ribs will take care of that game. When breakfast is done it will be time to pack up the car and make that early drive across the bridge toward the start of your new school year. Today is your first day in First Grade. I am nearly as excited for this as you are. The homework will be harder, the reading more advanced. I will be by your side to help you along the way. If you give it your all I have no doubt you will meet every challenge and continue to be a top performing student. You have an enthusiasm for school that I hope will never fade. If this year is anywhere near as joyful as kindergarten then we are in for many months of adventure. So, let’s go, my sweet girl. It’s time for school. Entry filed under: Being Dad. Tags: Babies, Beer, Being Dad, Brewing, Children, cooking, Dad, Family, Fatherhood, homebrewing, Kids, Life, Mom, Motherhood, Parenting, Parents.